Being in New York Recently I though I would Share a few tips and some great places to eat while you are there. There is so much to do here so you may not get to it all in one visit. Use the Air Train from JFK this connects with the Long island railroad (LIRR) at Jamaica station, straight to Penn Station right in the heart of Manhattan. About 35min Total. Air Train is $5, pay at Jamaica station, Long island Railroad depends on times approx. $7.You can buy a combined Air train and LIRR ticket once you arrive at Jamaica station. If you are the for more than 4 Days Buy an Unlimited ride Metro card $30USD as each trip is $2.75 so if you are exploring the city the 7 day Card is much better Value. If you have time Visit a Gospel Church (amazing), See a Show on Broadway, you can get Half Price tickets at the Time Square Ticket office. Address: 67 W 44th St #1, New York, NY 10036, United States. 409 Fulton St, Brooklyn, NY 11201, United States,We went to the one in Brooklyn Just near the Brooklyn Bridge. Great Value, Great Burgers really enjoyed it here. Again we went to the one in Brooklyn for cheesecake and coffee, we did not eat dinner here but the food looked great and lots of it. The Coffee was good and the cheesecake was amazing. This entry was posted in Photography, Travel and tagged Air Train, America, City, Holiday, Jamaica station, Lightroom, Manhattan, New York City, People, Photography, Restaurants, transportation, travel. Bookmark the permalink. I like the light in this picture and the atmosphere it creates. 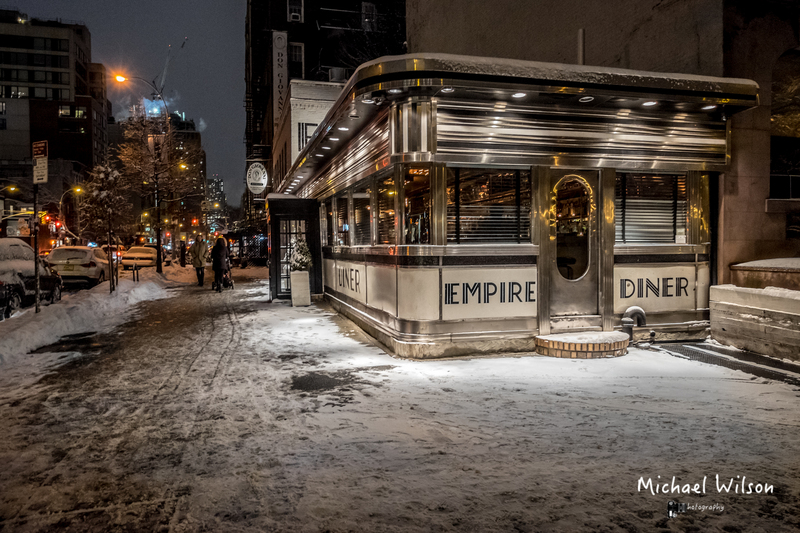 Empire Diner, a very classy image. I forgot to mention that in addition to a great post, I like the cool photo! Thanks so much, and I am sure you will enjoy them. It is hard not to naughty, so much great stuff to eat !! Wonderful image Mike! Great shot!